A variant of the U.S. Army's Future Vertical Lift (FVL) Capability Set 1 is a "likely replacement" for the U.S. Special Operations Command's fleet of A/MH-6M Little Bird (MELB) helicopters, James Smith, the SOCOM acquisition executive, told attendees at the NDIA Special Operations/Low-Intensity Conflict Symposium on Feb. 6 in Arlington, VA.
Smith made his statement in response to a question from retired Army Gen. Richard Cody, the former service vice chief of staff who received a Distinguished Flying Cross as an AH-64 Apache pilot during Operation Desert Storm in 1991. Cody said that FVL Capability Set 1 "could be much larger than the current MELB" and stated his belief in a role for small, stealthy, reconnaissance rotorcraft, especially given the growth in mega-cities, those with a population of 10 million or more, in countries in which the U.S. military may act in the future. The United Nations listed 33 such cities in 2018 and said that there could be 43 by 2030. Cody said in an interview after Smith's address that small, stealthy reconnaissance SOCOM helicopters will have a niche role in establishing a security perimeter around such cities and helping to direct precision U.S. Air Force and Army standoff strikes as well as special forces' helicopter insertions in tight urban terrain. Such capabilities would help the U.S. avoid operating in an "urban canyon," such as the Russians faced when Chechens defeated them in the first Battle of Grozny in 1996, he said. 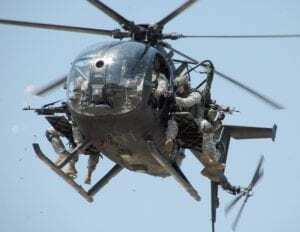 The 160th Special Operations Aviation Regiment – the "Night Stalkers" – based at Ft. Campbell, Ky. operate 51 Little Bird helicopters by McDonnell Douglas. The Mission Enhanced Little Bird (MELB) program, which ended in 2015, added a sixth blade to the main rotor of the J model and an improved tail rotor drive system, among other upgrades. The MELB "M" models have a maximum gross weight of 4,700 pounds. Block 3.0 upgrades to MELB are underway, including a longer tail boom, new rotor blades and rear gear box, a better ability to fly at high altitudes in hot weather, a higher payload capacity, improved flight controls, and an improved cockpit with a full moving map. SOCOM has said that it faces a decision point in 2024 when the command will have to decide whether to upgrade the Little Birds to a Block 3.1 configuration or procure a replacement under FVL. Cody said that SOCOM should reduce the weight of its Little Bird fleet, in part through miniaturization of the mission equipment, and also consider an improved four-bladed main and tail rotor to retain speed. Such changes would allow more payload and increase the capabilities of the Little Bird, he said. SOCOM did not respond to a request for comment by press time on Feb. 7.